With its separate mixer, multiple racks, audio tracks and new devices, Reason 6 is a huge update from previous versions. Since its first release back in 2000, Reason has trodden a somewhat different path to most other music software. Developed by the Swedish company Propellerhead Software, its roots lie in Rebirth, the groundbreaking emulation of a clutch of Roland grooveboxes that was first seen for Mac and PC in 1997 and now has a new lease of life on Apple's iOS platform. Rebirth established many of the ground rules for how software emulations of hardware devices can work, and Reason took it to a whole new level, giving users a virtual hardware 'rack' to play with, and a bunch of ready-made synths, samplers and effects units to fill it. Then, if you wanted to explore more complex setups, you could flip the rack around and tinker with its audio and CV (control voltage) modulation connections. Everything was very visual and clear, almost tactile. Throw in a straightforward sequencer and the whole thing made for a hugely appealing software design model, presenting a friendly face to newcomers but allowing for deep experimentation too. When first released it was nothing short of revelatory, and even now, over a decade later, the design still seems fresh and fun. In 2009, Reason was joined by Record, a sister application that offered multitrack audio recording — something that Reason always conspicuously lacked. This also used the 'rack and sequencer' model but improved it in many ways, perhaps most notably in providing a separate audio mixer which could grow in size to accommodate however many tracks you were using. What's more, if you also owned Reason, all of that application's synths and samplers would be available for use. The Reason/Record duo was Propellerhead's first full-blown DAW, but needing to have both applications installed when you'd probably only ever work in Record never felt very satisfactory. The potential for confusion when it came to purchasing, upgrading and authorising was also vast! Reason 6 signals the end of this situation. It's effectively the old Reason/Record combination in one application, and as a consequence, Record is now discontinued. So Reason 6 is everything Reason ever was, but it now has audio tracks, a better mixer, rack and sequencer, new effects devices, 64-bit operating-system compatibility, and many less obvious improvements. It's a milestone in the development of the application, and for Reason users who never tried Record, some aspects are going to feel really new. Reason 6's working environment is based around three main elements: the mixer, the rack and the sequencer. These can appear together as resizable horizontal 'panes' in a single window, which can itself be resized to best fit your monitor. Hitting your computer keyboard's F5, F6 and F7 keys causes the mixer, rack or sequencer, respectively, to fill the entire window, and the same key returns to the multi-pane view. The mixer and rack can also be detached to become independent windows, which will suit users with multiple monitors. Accompanying these three main elements are a handful of 'navigators': smaller overviews of the contents of each pane, complete with draggable handles. These take the place of conventional scroll bars and allow you to zone in on individual mixer channels (and the individual sections of a channel), rack devices, tracks and sequence regions. A transport panel with playback and record buttons, time and tempo displays and the like attaches itself to the bottom of any main window you have open. And there are three optional floating windows: a multi-purpose Tool window, a 'piano keys' display (for allowing some MIDI input when you've only got a computer keyboard or mouse available), and a recording level meter. All three can be toggled open and closed with more F-key shortcuts. Let's take a closer look at the rack. 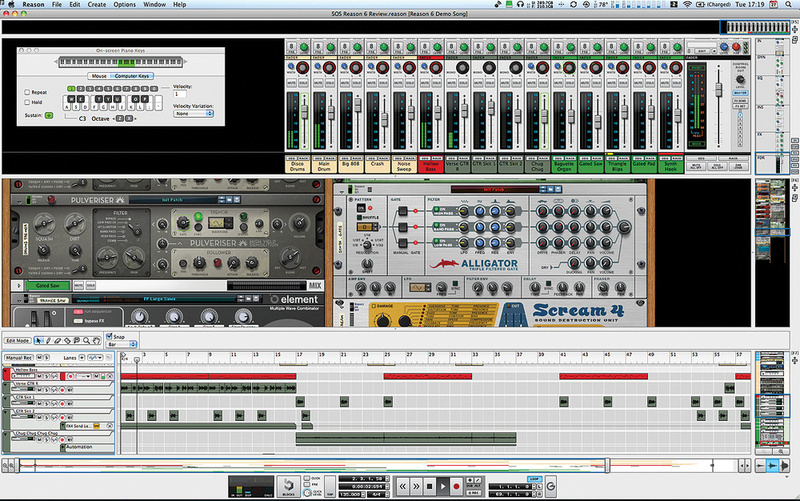 This is where you create and interact with Reason's various virtual devices. In previous versions, it was strictly a single-column affair, and as a result, the stack of devices could become will-to-live-sappingly high. In Reason 6, though, there are multiple rack spaces available side by side, allowing you to organise devices more meaningfully. How many, exactly? Propellerhead don't say, and I got bored with trying to find the limit after inserting devices into 32. Suffice to say that you shouldn't be running out of organisational options even if you have hundreds of devices in your song, which is not out of the question with modern computer hardware. It's in the rack, too, that you decide whether to view the front or rear panels of your devices: the Tab key toggles the view. Reason 6 offers nothing new in its basic handling of audio and CV cables, but compared with older versions, the whole concept of audio mixing has been overhauled. The Mixer 14:2 and its little Line Mixer 6:2 counterpart still exist, but are very much relegated to occasional submixing duties now. Instead, when you create an instrument it appears in the rack with its outputs feeding into an accompanying Mix Channel device. Likewise, when you create an audio track, it appears in the rack as an Audio Track device. Mix Channel and Audio Track devices act as conduits to the main mixer (of which much more in a moment) and for each in your rack there will be a corresponding mixer channel. The floating Tool window offers a whole range of additional editing and configuration options. So that's the infrastructure covered. What about the devices themselves? There's a broad range of synths, samplers, effects, dynamics treatments, creative processors and problem-solvers (the box at the end of this article gives an exhaustive breakdown). What Reason 6 patently lacks is any modelled versions of hardware classics, so you won't find overt emulations of Pultecs, Neves, Lexicons or Moogs, to pick a few studio luminaries at random. And forget VST, Audio Units or any other plug-in format: Reason 6 is very much a self-contained ecosystem that simply doesn't do plug-ins. The trade-off for the lack of expandability is undoubtedly stability and ease of setting up. There's also the argument that the open-ended possibilities for modulation of one device with another can more than make up for any perceived shortcomings — and that's especially applicable for synths and effects. As you'd expect, Reason's sequencer handles audio and instrument tracks side by side, and it also includes a Transport track by default, for tempo automation and time-signature changes. The time ruler is fixed to a bars-and-beats time format, but is accompanied by a Time Position display in hours, minutes, seconds and thousandths of a second in the Transport strip. Sequence data appears in track lanes in what Propellerhead call Clips. These are notional 'containers' of audio, note, automation and pattern data that can be selected, resized, dragged and duplicated for editing and to build up repetitive structures. Audio clips also have level and fade in/out handles. There are actually two distinct editing modes in Reason. In Song View, you work with clips on an overview scale, and the data for multiple tracks is visible. In Edit Mode, which can be entered by double-clicking a clip, a more detailed view of an individual track appears, and there are frequently multiple rows of information. For example, an instrument track might display a piano-grid display as well as note velocity and several additional rows for parameter automation data. Audio tracks display multiple takes in a very elegantly designed 'comp' editor. For general editing, there's a small palette of tools, selectable with a mouse click or keystroke, and they're intuitive and uncomplicated in use. The pencil tool lets you draw in new clips, automation or note data. The razor tool splits clips, and the mute tool — surprise, surprise — mutes them. Numerical values for selected data appear in an Inspector strip at the top of the sequencer, and they can be directly edited when you want to work in that way. A simple edit grid system constrains dragged data or allows it to be positioned freely, and it's smart enough to remember separate grid settings for Song View and Edit Mode. There's another way of working with the sequencer too, in Blocks mode. Here you develop individual song sections in isolation and then later, in Song View, arrange them into large-scale structures. It's a dynamic system, so if you change something in an individual block, the large-scale arrangement instantly includes that change. You can also make localised overrides and additions: if, for example, you use a verse section twice, it can have some clips muted the first time, and a few new ones added the second. It's a nicely implemented system that makes experimenting with song structure remarkably easy. Additional editing possibilities come in the form of the floating Tool window, which carries extra quantisation options, plus transposition, velocity and note-length functions, amongst others. Focusing on the transport section for a moment, a pair of L[eft] and R[ight] markers define Reason's playback loop region, and an E[nd] marker indicates where a song finishes when it's exported (bounced) as an audio file. There are no user-definable markers, though, so if you like to label up song sections you'll be out of luck. Any sort of punch in/out function is also conspicuous by its absence. The metronome click is simple and effective, though, and offers a one- to four-bar count-in option. The back of Reason 6's virtual rack, with its audio and modulation cabling, is still one of its most distinctive and powerful features. In case I haven't made it clear enough already, Reason 6 has audio recording — woo-hoo! And one of its headline features is real-time time-stretching, so you can record at one tempo and play back at another, with no change in pitch and surprisingly little impact on quality. Audio Track devices in the rack have a Stretch Type parameter with three different values optimised for different types of material: Allround, Melody and Vocal. However, there's no audio quantising, of transients or anything else, and no manual manipulation of the waveform like Logic's Flex Time. Entirely new in Reason, though, is real-time transposition of audio clips, which can be shifted by up to an octave higher or lower, making successfully harmonising loops and samples taken from multiple sources a much more viable option. The Reason 6 mix architecture is still very much stereo-only, and you can neither mix in surround nor import surround files. Audio tracks can, of course, be mono or stereo, and along with a hardware input menu on every audio track there's also a handy tuner function, so no more excuses for sick-sounding guitar takes. The very clear input monitoring scheme is worth a special mention. A Preferences window option lets you choose one of three different monitoring modes: Automatic, Manual and External. These control how the monitor enable buttons on audio tracks interact with the record-enable button — or, indeed, whether 'software' monitoring is enabled at all. Suffice to say that it's extremely easy to understand in use, and easily adapts to pretty much any conceivable hardware setup and monitoring requirement. Previous versions of Reason had to make do with a 14-input mixer for all mixing duties, but in Reason 6, the mixer is a separate entity that's also modular — it gains channels as you add tracks. Rather than rigidly emulating hardware practice in having virtual audio cables running from each device to a patchbay, the rack sends audio to the mixer via Audio Track and Mix Channel devices. That keeps audio cabling local to individual devices, which is very sensible. There's nothing compact about Reason's mixer. This composite image shows a single channel strip, next to the master section. The Reason 6 mixer is inherited from Record, and originally Propellerhead touted it as an emulation of an SSL K-series console. I notice that association seems to have evaporated nowadays, but still, the Reason 6 channel strip is appropriately feature-packed, and absolutely huge. Every channel has eight pre/post sends and returns, four-band parametric EQ, high- and low-pass filters, a compressor and a gate/expander. There are also user-configurable knobs and switches for directly controlling parameters that are part of a track's insert effects. A built-in stereo mix-bus compressor supplies some 'glue' and punch when necessary. Impressively, there's also a proper Control Room section, which, as well as having a separate monitoring level control, also lets you monitor any of the aux sends or returns. That's a fantastic feature for setting up really good headphone monitor mixes for individual musicians. Because the channel strip is so long, buttons are provided to let you show or hide individual sections of it. Each channel also gets dedicated Seq and Rack buttons that instantly locate and display the sequencer track or rack device associated with the channel when you click them. This makes navigating a really complex mix much easier. Installed along with the Reason 6 application are two bundled patch and sound libraries: the Factory Sound Bank and Orkester. The former is 1.87GB in size, up from 1.61GB in Reason 5. Orkester occupies around half a gigabyte. The factory patches do a good job of showcasing each device — I particularly like the Signature Patches for the Thor synth, which include some stunning sounds from the great and the unhinged of the electronic music world. There's also a good variety of 'production' sounds for NNXT, Kong and Dr Octo Rex, which build into fine-sounding arrangements in no time at all. Orkester is a bread-and-butter orchestral sound set, and certainly useful to have, but the number of instrumental articulations provided is limited, and it's far from state-of-the-art. Still, plenty of add-on libraries — Refills — are available from Propellerhead and other developers to supplement these two starting points. Access to sound banks is through a patch-recall system common to all devices that offer presets (some of the half-rack effects and 'problem solvers' don't). The patch-browser dialogue window has good search and audition facilities and a favourites system, and it maintains a list of Recent Patches. While all effects settings are, as you'd expect, saved along with a Song file, it's possible to save patches separately too, in which case they exist outside of the (read-only) sound banks as separate files. There's clear information available about audio files and samples too: the Tool window and an associated main menu command make it clear which samples are actually in use in a song, and which are 'self-contained': in other words, actually saved with a Song file rather than merely being referenced from somewhere else on your hard disk. Getting up to speed in Reason 6 is not hard. If you previously used Record as well, it's essentially the same application, albeit with some new features. For Reason upgraders, there are new concepts to absorb — especially the use of Mix and Audio Track devices to interface with that exciting new mixer — but nothing that couldn't be mastered in a few minutes. Also, Reason 6 will open any existing Record, Reason or Record/Reason Duo Songs without difficulty. Complete newbies should be all set, too. Reason is notably easy to grasp, and doesn't have that overwhelming, labyrinthine quality that many heavyweight DAWs do. A helpful first-run procedure discovers what MIDI controller devices you're intending to use. Thereafter, the up-front graphical nature of the rack and mixer positively encourages tweaking and experimentation. Other factors are important here too. Having EQ and dynamics on every mixer channel feels like a real luxury compared to DAWs where you have to instantiate dozens of separate plug-ins to achieve the same thing. And Reason 6 maintains the excellent CPU efficiency of previous versions, letting users really pile on the tracks, instruments and effects without fear of running out of grunt. Of course, it'll happen eventually, but you'd have to have a colossal rack (cough) before it became any sort of problem. As for specific improvements, Reason 6 has plenty. Going hand in hand with the new mixer is improved overall sound quality. Previously, the 14:2 mixer had been associated with a distinct character of its own, prone to a sort of glassy opaqueness. The new mixer doesn't seem to suffer from this, and now, I think, sounds as transparent as any other DAW's mix bus. Audio time-stretch and transposition quality is amongst the best you'll find, and is implemented in a remarkably easy-to-use fashion. Then there's the new effects devices. The Echo is really vibey, with a genuine old-school flavour, and I imagine its intriguing Triggered and Roll modes, which allow you to really 'play' the effect, will keep experimental users happy for a long time. 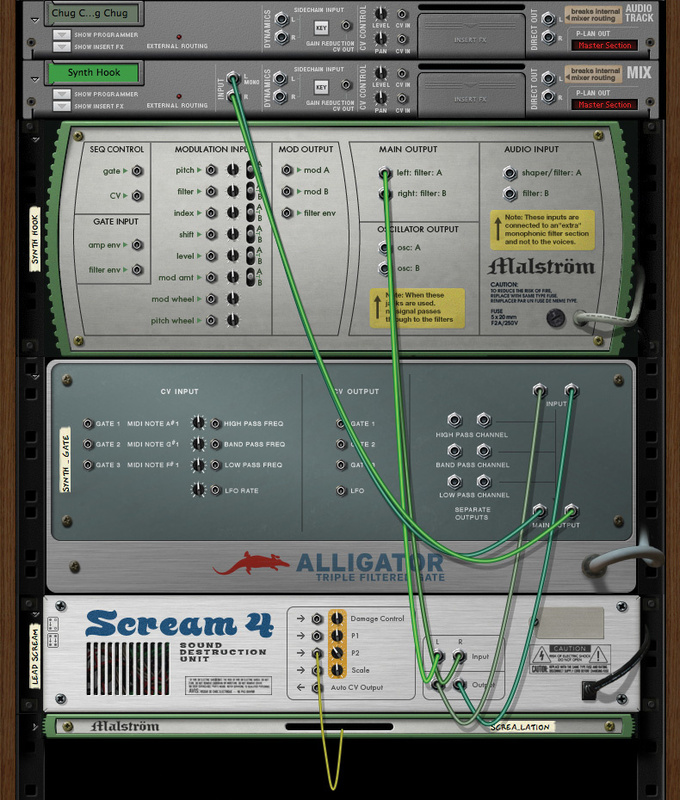 I think Alligator is even more remarkable: it offers deep programmability, and can really transform pads, loops and drum patterns in very contemporary-sounding ways. Its gates can also be triggered manually, opening up possibilities for glitchy vocal treatments and selective delays. Pulveriser is possibly more of a 'sleeper', but as compressors go, it's not short on character, and it'll find use on drums, guitars and much else besides. Meanwhile, Reason's former strengths remain undiminished. Having a prix fixe selection of devices keeps your focus very much on your production, and on using the tools available to best effect. It's often a relief to not have to choose from hundreds of third-party plug-ins, and not to have to deal with the specific quirks, compatibility and authorisation issues that can go with them. Similarly, the sequencer is disarmingly simple and immediate in use; in fact, the whole application is very fast and responsive at all times. Looking at individual devices, the Thor and Malström synths cover a huge amount of sonic ground, offering everything from hissy digital to dark and lush analogue textures. 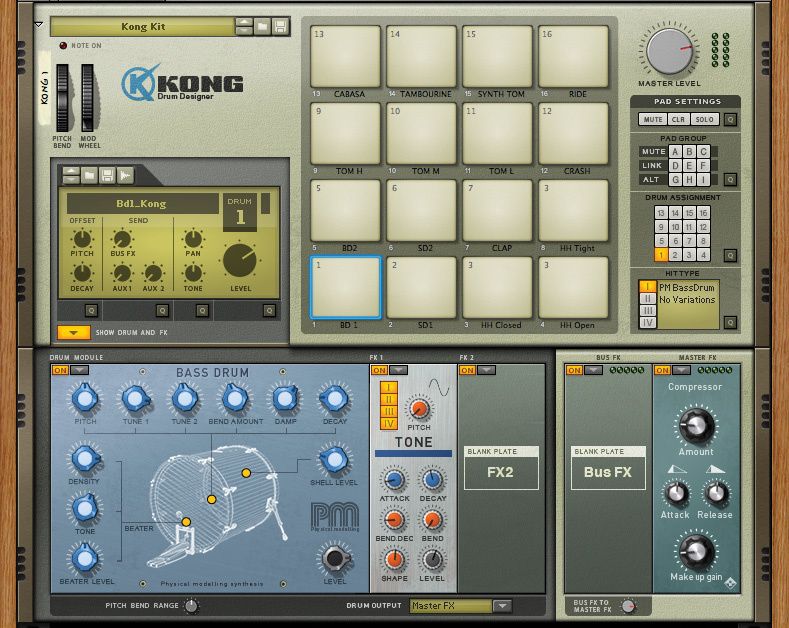 Kong is a fabulously capable drum module, capable of mimicking pretty much any drum machine ever produced, as well as generating very fine acoustic sounds. There's great variety amongst the effects devices too. RV7000 is an excellent reverb by any standards, and Neptune goes well beyond simple pitch correction and deep into 'creative' territory. The same is true of many other effects, in fact — they're frequently capable of far more than you might first expect, especially when you utilise their rear-panel modulation connections. Paradoxically, some of Reason's greatest strengths are also its most infuriating weaknesses. First and foremost, the rack can all too easily end up a massive, confusing sprawl. Various organisational features help, such as the multiple rack columns, improved device naming behaviour, device groups and the Combinator, but other DAWs allow the same level of mix complexity without the accompanying visual onslaught. Then there's the self-sufficient nature of the application. For all the advantages this offers, Reason 6 still feels under-provisioned in some areas. Some effects types are missing: there's no convolution reverb, for example. Nor are there any really out-there glitch treatments, or granular synthesizers. There's a fairly limited choice of compression and EQ character, and no dedicated multi-band compressor. As for really specific and sophisticated treatments, such as drum replacement, noise reduction and restoration tools, forget it. Reason is just not that kind of DAW. NN-XT is undoubtedly an effective sample player, with very good third-party library support, but it's no Kontakt 5 or Mach Five 3. It doesn't have the same level of architectural complexity, or the scripting engines. Looking critically at the sequencer, it's currently not possible to quantise anything except notes. Audio clips can be manually time-stretched, but some form of within-clip manipulation, like Logic's Flex Time, would be a most welcome feature, as would the ability to quantise rhythmic audio, and to easily conform the time ruler to freely recorded material. More fundamentally still, I'm amazed that there's still no automatic punch-in and -out feature, or a marker system. Some simple movie support is surely overdue too. While I'm grumbling, I'll also mention that the use of clips to organise note data for instrument tracks often feels really clumsy. All too easily, note clips end up not meaningfully representing the data they contain: they'll start too early, go on too long, and subsequent overlaps between them end up muting and hiding notes you want to hear. They can be trimmed, of course, but that feels unnecessarily labour-intensive. The only audio formats Reason 6 can import are stereo or mono AIFF, WAV and various Recycle loops, and it exports only AIFF and WAV. It can open multiple songs simultaneously, but there's not the sophistication of audio file handling that would ever lend it to being used for classical-style or voice-over editing, mixing for picture, or mastering. Looked at from another, more positive angle, it's perhaps best to think of Reason as being optimised for a specific role. It's primarily a DAW for short projects such as single songs, and as such, it's not trying to compete with the likes of Pro Tools, Digital Performer or specialist audio editors. In a world that's positively bursting with DAWs, Reason 6 offers a distinctive user experience that's frequently inspiring and genuinely enjoyable. The simplicity and immediacy with which most writing and mixing jobs can be achieved is refreshing, and yet dedicated Reason 'programmers' can be kept busy for years too, creating complex multi-device instruments and effects that can sound spectacular. It has to be said, too, that in value-for-money terms, Reason 6 is absolutely astonishing. If you're on a budget it may be as far as you ever need to look — you'll have 99 percent of bases covered for less than the cost of some individual plug-ins designed for other DAWs. This distinctiveness isn't going to be for everyone, of course. Not having access to favourite plug-ins can feel like a drag, but any hardware synths you own will also sit there unused while you work with Reason, because of its lack of external MIDI tracks. For this, for some of its less attractive quirks, and for its obvious song-length project focus, Reason 6 isn't a DAW for all seasons. But then, individuality is good thing, so long as it appeals to you. Ultimately, Reason 6 is a great application. It's fun, sounds contemporary and lets you work fast. It extracts a huge amount from any reasonably modern PC or Mac. Using it is the perfect antidote to every crash and incompatibility that can plague other DAWs, and the vastly improved mix architecture clearly now provides a platform for further developments of other features. For existing fans it's a no-brainer. For new users, now's the perfect time to get on board. The range of devices on offer in Reason 6 is wider than ever, encompassing instruments, effects, and various sorts of 'problem solvers'. Here's a list of all of them, which I've divvied up into a few sub-categories. A fairly basic but useful virtual analogue synth with two oscillators, two filters and mono audio output. A two-oscillator wavetable synth with harmonic skewing and some interesting audio routing and modulation options. Reason's flagship synth, with three six-mode oscillators (including FM and phase distortion as well as virtual analogue) and an extensive modulation matrix. 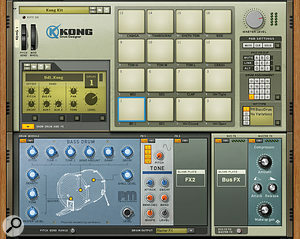 Kong Drum Designer Kong is a hugely sophisticated drum machine. A drum sound module combining sample replay, acoustic modelling and electronic sound generators across 16 virtual pads. Dr Octo RexA player of sliced Recycle-format loops. Up to eight can be loaded at once, and their playback dovetailed on the fly. RedrumA drum-sample module with on-board step time sequencer, in the manner of '80s Roland drum machines. Inherited from Record, this is a Reason's 'ROMpler', with 36 honest-to-goodness preset sounds. RV7000A computational reverb, with multiple algorithms and good delay capabilities. The Echo The Echo is a new device in Reason 6, offering tape-style delay effects.New in Reason 6, this delay unit is made up to look like a Roland Space Echo. With filters, modulation and tape manipulation features, it can do both simple and psychedelic. Neptune Pitch AdjusterReason's answer to Auto-Tune, but with some powerful features such as voice synthesis and transposition. Pulveriser DemolitionAlso new in Reason 6, Pulveriser is a compressor with onboard filter and distortion. It can sound more subtle than the name implies, and excels for parallel drum compression. 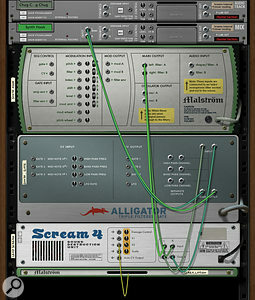 Scream 4 DistortionTen distortion types, from overdrive to bit reduction, and optional cabinet modelling. Alligator Filter GateThree complementary filter bands, each with a pattern gate, LFO, overdrive, phaser and delay. This is a real sound-mangler, capable of both beauty and mayhem. Line 6 Guitar Amp & Bass AmpPod-inspired guitar amp and cabinet simulation. The selection of models increases if you have a compatible Line 6 hardware unit attached to your computer via USB. PEQ2 Two-band Parametric EQWorkmanlike effects units with few parameters and a 'low end' vibe. MClass masteringA suite of processors — EQ, stereo imager, compressor and maximiser — primarily meant to make full mixes polished and hot. Matrix sequencerTriggers notes or generates CV values to create arpeggiated and step-sequenced note patterns and complex modulation effects. Line Mixer 6:2Problem-solvers and submixers, to help with audio and CV cable routing. 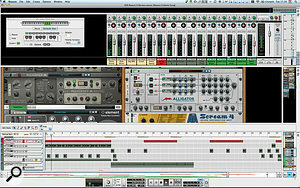 CombinatorThe Combinator is one of Reason 6's most powerful tools. It's a kind of host for groups of instruments and effects, facilitating layers and splits as well as complex audio routing and sophisticated mapping of hardware controller knobs to device parameters. Mix ChannelA utility device that acts as an audio 'bridge' from the rack to the mixer. Rebirth Input MachineThis provides 'legacy' compatibility for those few souls who still like to run Rebirth alongside Reason. As this start-up dialogue box reveals, Reason 6 can be authorised using a USB dongle or Internet verification. I'd hazard a guess that previous versions of Reason must be up there with the most copied and pirated music software ever. But criminals had better look out, because Reason 6 is much better protected. When installed (from DVD or download) it'll run in demo mode without restriction, and save songs too. Crucially, though, it won't open them. 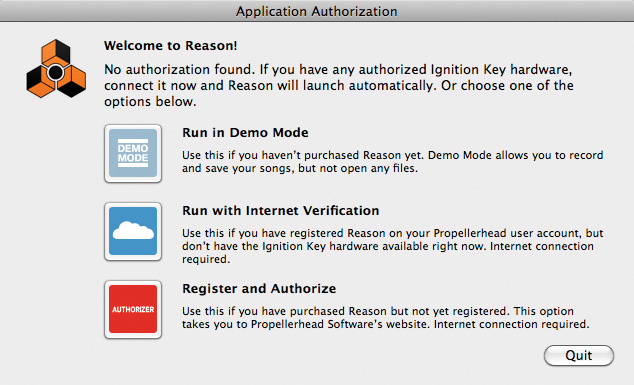 To enable that, you need to have registered your individual licence number in a user account at Propellerhead's web site, and then use that to authorise a hardware USB dongle known as an Ignition Key. One is included in boxed retail and upgrade versions of Reason 6, though Record and Reason 5 users may have one already. A helper application is provided to assist with this, and the process is quick and straightforward, especially if you have Internet access on your studio computer. 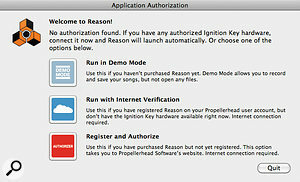 Thereafter, launching Reason with the dongle attached lets you enjoy the application without restriction. However, if you don't want to use a dongle you can also choose to 'run with Internet verification'. You'll need an Internet connection, of course, and your Propellerhead account user name and password, but then you'll be in. Copy protection is never popular, but this is probably as painless and flexible an implementation as any other. Mac OS X: Intel processor, OS 10.5.8 or later, 1GB RAM. Windows: Intel Pentium 4 or AMD Opteron or better, Windows XP SP3, Vista or Windows 7, 1GB RAM, an audio card preferably with an ASIO driver. Both Macs and Windows PCs also need at least 25GB free hard disk space, a DVD drive (if you don't opt for a download), and a free USB port for the Ignition Key dongle. If you just want to stick a toe in the Reason waters and the full price is too steep for you, you could consider Reason Essentials. It offers the same user interface as its bigger brother but loses out on some key features. The mixer has simpler EQ, fewer sends and no channel dynamics. In the rack, you'll have to make do without some of the best devices, including Thor, Kong, The Echo, Alligator, Pulveriser and Neptune. Essentials' sound library is smaller. too, and can't be so readily added to. It should still be a useful thing, though. Essentials also comes bundled for free with Propellerhead's Balance audio interface, which we'll be reviewing in due course. Reason gets audio recording at last! A great new mixer, improved rack, and more flexible user interface. Three fine new effects devices. High quality audio time-stretching and transposition. The 'virtual rack' approach can easily become cumbersome with complex projects. The self-contained nature of Reason's world won't suit everyone. Some aspects of the sequencer feel clunky and lack sophistication. Version 6 finally grants Reason full DAW status. Audio recording, additional effects devices and new features make it a more enticing prospect than ever, but only you'll be able to decide if life without third-party plug-ins will be a blessing or a curse. Reason 6 £349; Reason Essentials £229; upgrade to Reason 6 £139. Prices include VAT. Reason 6 $499; Reason Essentials $299. Upgrade to Reason 6 $169. Propellerhead Reason 6.0, build 1508. 2011 Apple MacBook Pro with 2.2GHz Intel Core i7 CPU and 8GB RAM, running Mac OS 10.6.8.